Mike and Kendra's May 4, 1970 website May 4 bibliography - annotated with critical information on sources drawn from a Masters thesis, by a former Library Science student at KSU, James R. Brand, published in May of 1985 and is entitled May 4, 1970: A Critical Annotated Bibliography. Of Loss and Learning - Akron Beacon Journal's 2000 retrospective on the "haunting reminders of Kent State deaths," including the controverial pictures of the slain victims clothing. Kent in Denial - Article by William A. Gordon and a fascinating exchange (bottom of the page) with Kent State wounded victim Alan Canfora. Infography - List of books mixed with resources on the web selected by an unnamed "expert". Bart Whiteman, "Yale University: Spring of 1970," Chattanoogan (web-only), Nov. 26, 2005. "On Monday, May 4, the day after the Seale rally ended in New Haven, the Ohio National Guard indiscriminately fired live ammunition at a crowd of Kent State University students killing four. Without knowing it, we had come very close to the precipice." Abby Terlecki, "Speaker recalls bad old (pre-'60s) days for women at OU," The Athens News, Oct. 17, 2005. "The year 1969-1970, during the 'black pride' and Civil Rights movements, was referred to in Athens as 'the year the school closed,' as a result of serious rioting related to the Vietnam War and Cambodian incursion. This is the same turbulence that sparked the rioting and fatal shootings at Kent State on May 4, 1970." Joanna Connors, "Protesters dust off familiar songs; We're hearing the familiar verses of 'War,' 'Where Have All the Flowers Gone,' and 'Give Peace a Chance' again.," The Plain Dealer (Cleveland), Oct. 10, 2005. "The summer after the Kent State shootings in May 1970, everyone heard the drumbeats. 'Woodstock,' the documentary, had come out in March. Anti-war singles were getting heavy rotation on FM radio. The music was mainstream enough in American culture that even middle-aged parents knew some of the lyrics." Eman Varoqua, "Fracas over a protest; Impromptu service for Kent State draws a crowd - of agents," The Record (Bergen County, NJ), May 5, 2005. Tommy Silva heard it on the radio. 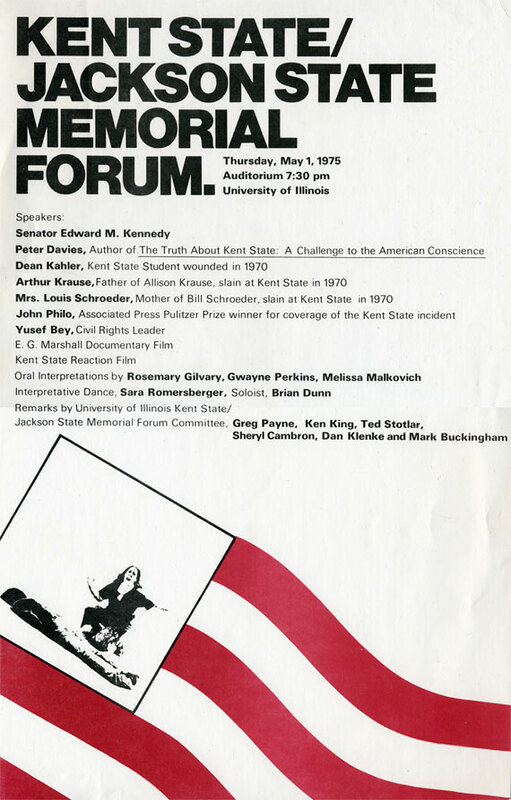 It was the 35th anniversary of the Kent State University shootings Wednesday. We should do something, he thought. The plan was simple: Silva and his pal, John Sargis, would show up at a Paterson landmark and lead a service to remember the day the Ohio National Guard shot and killed four students who were protesting the Vietnam War. Marilyn Miller, "Kent State remembers students killed protesting Vietnam War," Kansas City Star (Knight Ridder Newspapers), May 4, 2005. "Most Americans old enough to remember President John F. Kennedy's assassination can recall what they were doing or where they were when it happened. "But the sister of one of the four students slain at Kent State University on May 4, 1970, told about 500 onlookers Wednesday that probably only a handful of people remember what they were doing when those shootings occurred during a Vietnam War protest. Nancy Tuttle remembers. She was in Lawrence, Kan., with a month-old boy. Her brother, William Schroeder, was one of the four killed."